Chicken and waffles, just dig in and enjoy. If you have ever wandered along the Sunabe Seawall then you have surely passed by the CC’s Chicken & Waffles restaurant, only to be stopped in your tracks, wonderstruck by the mention of the sweet and savory combo that lends this popular restaurant it’s name. Intrigued that this odd fusion is popular enough to justify there being a prominent restaurant dedicated to its consumption, there was no way around it. I had to pop in to try the ‘chicken and waffles’ for myself. I’ve always been led to believe that chicken is eaten for dinner while waffles are usually for breakfast, and never before have I considered consuming the two together. The thought of this flavor medley does not immediately conjure images of overactive salivary glands and dancing taste buds. Much to my surprise, the taste was not as offensive as expected, and the two actually complimented each other well. If you are trying to reduce the amount of cholesterol or fat you’re consuming, my first inclination would not be to suggest that you consume chicken and waffles on a regular basis. Nonetheless, it was a delicious treat for my wife and I who are normally health food fanatics. 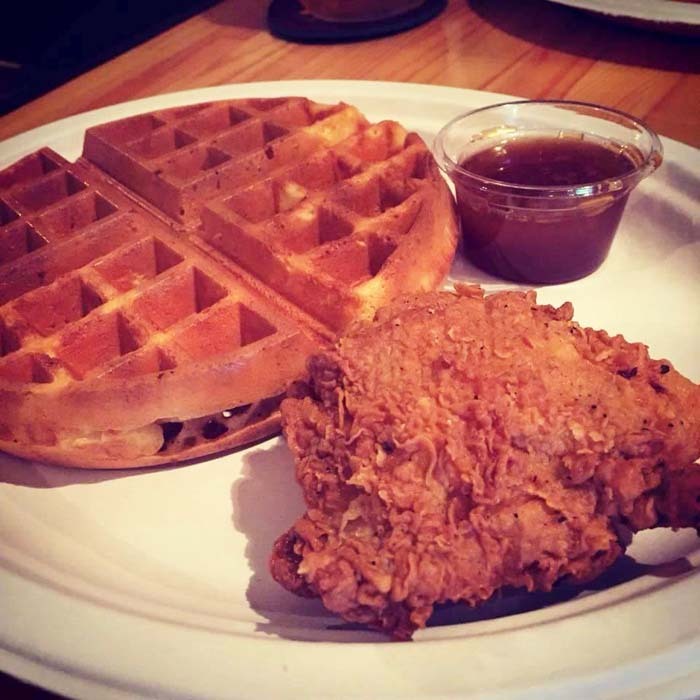 I would definitely suggest that you take the plunge into a blissful chicken and waffle dish and find out for yourself. Upon finishing the last bite of my delicious chicken and waffles, I still was curious about who thought of putting this intriguing combo together. A chef in Kin Town invented Okinawa Taco Rice, so where and who invented Chicken & Waffles. In my quest for an answer, the exact origin was hard to pin down but, essentially, they were originally served in the 1800’s in resorts and hotels around of Philadelphia as a fried catfish and waffles combo. Since catfish was seasonal, it was replaced with chicken during the off season. American waffle iron companies would advertise that their waffle irons could be used to prepare your own chicken and waffles supper. Most people would immediately associate the dish with the southern United States when actually, it did not appear in the early Southern Cook Book published in 1881 titled What Mrs. Fisher Knows About Old Southern Cooking by former African American Slave Abby Fisher. Fischer’s cookbook is considered the first cookbook written by an African American. Whatever the case, many modern variants of the dish owe their origins to the African American community in Harlem, New York. In the 1970’s, Hollywood celebrities made Roscoe’s Chicken and Waffles Restaurant in Los Angeles famous when it was featured in several movies. Just when I thought chicken & waffles couldn’t get more crazy, I discovered that there are great variations to the dish that exist outside the scope of the versions that I have tasted myself. The dish I ate consisted of fried chicken with a side of waffles and syrup, yet there are far more exotic ways of serving the medley. The traditional Pennsylvania Dutch version consists of a plain waffle with pulled or stewed chicken mounted on top and then covered with gravy. This version is more regularly offered in the Northeastern United States. If you happen to be a health fanatic like me, then it’s about time you put aside your conscience for a day and dive into a calorie-heavy saturated fat dynamo that will quickly test your fortitude for the robust North American meals that you left behind when you stepped onto Japanese soil.